What a cute frame! Sparkles shine around the 2 hearts and on the word "love" written on the bottom of the frame - a nice touch that your flower girl will love. This "Thank You To Our Flower Girl" gift is personalized with names and wedding date. Your little flower girl looking adorable and all dressed up like a princess is excited about sprinkling the flower petals to guide you down the aisle. 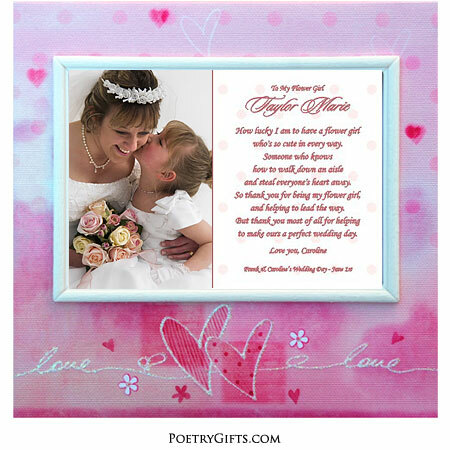 Thank her for the important role she will play on your wedding day with this pink sparkly heart flower girl frame and touching poem. We personalize the poem with her name, the bride and groom's names, your wedding date, and a personal message from you. There is also room for a wedding photo of you and her. 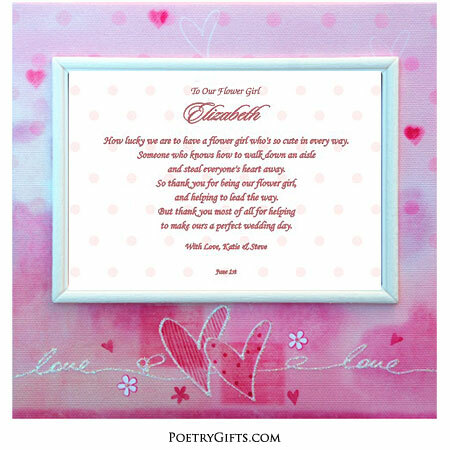 The little princess can display this adorable frame and poem in her room as a constant reminder of your's and her special day! 3. Closing Phrase and Your Name(s) (as seen after poem) - (Examples: You're The Best Flower Girl Ever, Love Aunt Lynn & Uncle Chad; With Love, Mackenzie & Blaine; etc.)" 4. Phrase and Wedding Date as seen after poem - (Examples: On Lynn & Chad's Wedding Day - June 1st; Blaine & Mackenzie's Wedding Day - 6/1/19)"
who's so cute in every way. and steal everyone's heart away. and helping to lead the way. to make ours a perfect wedding day. The outside measurements of the frame are 6-1/2 inches x 6-1/2 inches.The photo opening is approximately 2-1/4" x 3-1/4". This size opening is perfect for a large wallet size photograph, but you can also display the most important part of a larger photo. If you do not want a photo area in your Poetry Gift, choose the No Photo Area option when placing your order.